The restaurant supply superstore carries a wide range of salad dressings from Ach Foods, Hidden Valley, Kraft Foods and Portion Pac. We have the usual creamy italian dressing, regular italian dressing, thousand island dressing, buttermilk ranch dressing, honey mustard dressing, vinaigrette and french dressings for your buffets and salad bars. Hidden Valley Cheese Dressing Dry Mix Blue - 3.1 Oz. Kraft Raspberry Vinaigrette Fat Free Dressing - 1.5 Oz. Portion Pac Americana Buttermilk Dressing - 12 Grm. 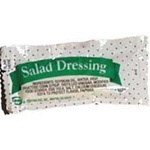 Portion Pac Salad Dressing - 12 Grm. Unilever Best Foods Hellmans Country Buttermilk Dressing - 3.12 oz. Ventura Foods Sweet N Tart Dressing - 1 Gal. Dukes Coleslaw Dressing - 1 Gal. Our fat free ranch dressing is the top seller in America whereas the red russian dressing is a popular specialty salad dressing. We carry commercial salad dressings in 1 gallon jugs for commercial kitchens down to 1 oz packets to serve on your patrons plates as well. Buy Restaurant Salad Dressings today that are great for restaurant and hotel foodservice catering. A plant based diet will increase your odds of living a disease free life, so help your patrons enjoy eating plants with these tasty dressings. Salads are a nice, cool refreshing meal in the hot summer as well. We delivery cases right to your door.